Author Randy L. Schmidt, who’s recent book “Judy Garland on Judy Garland – Interviews and Encounters” is now available, has taken time out of his busy schedule to answer a few questions about his book and Judy Garland. Thank you Randy!! 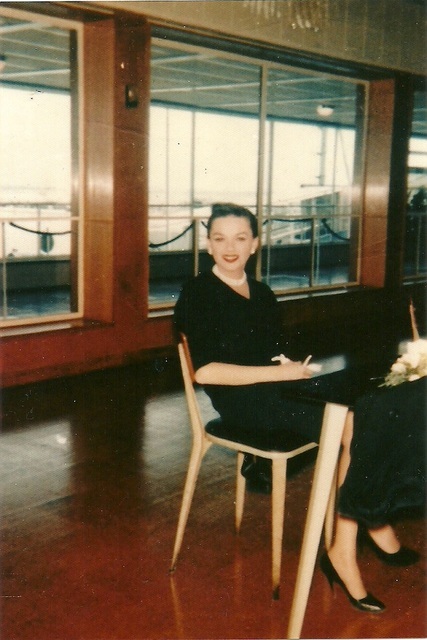 The Judy Room: What was the impetus for writing Judy Garland on Judy Garland? Randy L. Schmidt: The initial print run for 2010 book Little Girl Blue: The Life of Karen Carpenter sold out in pre-orders alone. Around that time, I remember my editor at Chicago Review Press said, “So what’s your next book?” I was shocked. I never imagined I’d be invited to do another book, especially before my Karen book was even out in stores. My editor and I kept bouncing ideas back and forth and at some point I came across their “Musicians in Their Own Words” series. I saw Coltrane on Coltrane, Hendrix on Hendrix, and others. Judy came to mind. I was encouraged by my editor to work up a full book proposal and they seemed to love the idea. I’d never been all that satisfied with the existing Judy bios, but had always been fascinated with Judy’s own take on her life. After I began to dig for material and realized how much Judy seemed to want to tell her own story, it became that much more important to me. As with any book I’ve worked on, I set out to construct a book I longed to read, in this case on the subject of Judy Garland. How did you gather all the documentation needed for the book? I did a great deal of research at libraries. I spent a week in LA and spent lots of time at the Margaret Herrick Library in Beverly Hills. I also did a week in New York City and notably the New York Public Library for the Performing Arts. There are several large collections of Garland memorabilia there. Much of the material for JUDY ON JUDY was in public domain. The material originally published prior to 1964, unless copyright was specifically re-registered, was available to me with no permission necessary. Things like the Barbara Walters Today interview had to be cleared through NBC Archives. The Gypsy Rose Lee transcription was done with permission of Gypsy’s estate. The final interview from Copenhagen in 1969 was done with the blessing of the interviewer’s widow and Radio Denmark. The process of researching and seeking permission is something I enjoy and I find the challenge to be exciting. It’s sometimes frustrating, but overall exciting. I look at it as a big puzzle. It’s so much fun to watch the pieces as they fall into place, and it’s equally disappointing when they don’t. There are certain documents, such as the Random House manuscript and the McCall’s articles, which are not included. Can you tell us how that happened? I had high hopes for the Random House manuscript, but once I got the chance to really pore over it I realized it was a bit of a mess. There were several chapters with potential and they were in Judy’s “voice,” but much of it was rough draft and really more of Fred Finklehoffe’s notes than what I’d call a manuscript. Also, since it was never officially published, it did not fall into public domain. Using more than a few excerpts would have required permission of the estate. Although it’s an important document, it’s not in any way publication ready. Concerning the pieces originally published in McCall’s (“Judy Garland’s Own Story: There’ll Always Be an Encore” from 1964, and “The Plot Against Judy Garland,” 1967), I had permission from McCall’s, but copyright on those technically falls back to the estate. I reached out to Lorna but the timing was bad. Just a week or two after contacting her, the statement was made about her battle with cancer. Her management was very cooperative and tried to make it happen for me, but it just didn’t happen in time. I may revisit this before the paperback is published next year. Those pieces would be great additions. Many of the tapes Garland recorded for the planned Random House book have been in circulation in collectors’ circles for years. Did you consider transcribing these and including them in the book? I did. Again, there were some technicalities with permission and ownership. Although other authors have used them liberally, we played it safe, I suppose, and just used them sparingly throughout the book, sometimes just in editor notes and such. I decided those recordings were more important to support the idea that Judy wanted her story told and wished to see her autobiography published than something that needed to be transcribed in their entirety. Some of the information in the movie magazines, such as the fact that Judy was reading Mein Kampf in the 1940s, seems more hype than fact. Should the reader believe everything printed in the 1930s and 1940s? The movie fan magazines and everything printed under the guise of Metro’s publicity machine should be suspect. While the majority of it is pure gold—even just for the sake of preservation—some of it is obviously studio generated fluff. I didn’t want to try to correct every little thing. Instead, I felt the statement in the Preface would suffice. It was a disclaimer explaining that everything you read may not be true, but it was the Judy that we were given in the press at that time and, in turn, important to her story. I love the contrast between sections I and II (the 1930s and 1940s) and the rest of the book. We see the real Judy begin to emerge in the 1950s and then she really breaks through in a big way throughout the 1960s. Did your view of Garland change as a result of putting together the book? If so, how? I always knew she was sharp and witty, but I came to appreciate just how fine tuned those qualities were as this book began to take shape. She was such an incredibly talented storyteller and I think she began to realize that in the 1960s. The response to her 1962 Jack Paar Program appearance seemed to give her a newfound confidence in her ability to communicate in a way other than singing. After that, she seemed quite aware of her ability to tell a story in a fun way and she could land a zinger like no one else. The book presents Judy in her own words, without a point of view. What is your point of view on Judy Garland? I think of Judy as a power-packed ball of energy. A freak of nature. She had the unique ability to connect one-to-one with her audience, and was equally effective at communicating through multiple mediums: on film, on her recordings, and on the concert stage. She was not a tragic person. She was optimistic and usually positive. More than anything, she could laugh at herself and find the humor in some of the most tragic situations, and she never succumbed to the negativity. When and how did you first become a Garland fan? I fell in love with Dorothy when I first saw The Wizard of Oz at the age of four. I recall getting my first Judy Garland “greatest hits” album when I was six and I was shocked to hear the mature 1960s Judy vocal sound. It was at that point that I began to understand she was an actress and singer and more than Dorothy Gale. I was the kid with an Oz/Judy museum in a building behind my house on our family farm! For fun, what is your favorite Garland film, and why? Aside from Oz, I tend to gravitate toward Meet Me in St Louis for its obvious beauty and sentimental reasons I suppose, but also have a special fondness for Summer Stock. I love to see her dancing with Gene Kelly. And she is so gorgeous in Presenting Lily Mars. That finale is one of my most watched Judy film clips. For more fun, do you have a favorite Garland song, and why? “By Myself,” the slow version. I love the building intensity. In closing, do you have any remarks for the fans? First of all, my thanks to the fans who helped to make this book even better. So many people offered their collections and assisted in various ways. I do hope that fans in general will all find something they love about the book. It’s really a special book to me and I am proud of the way it came together so beautifully. And the cover blows my mind. I could stare at it for hours. My goal with this project was to place Judy front and center, in the spotlight, and just let her talk. is the author of the acclaimed bestselling biography Little Girl Blue: The Life of Karen Carpenter and the editor of Yesterday Once More: The Carpenters Reader. He has also written articles for the Advocate and the Observer. He teaches music in Denton, Texas.